After an extremely nervy 45 minutes in Sydney, the scores between Australia and Honduras remained locked at 0-0 on Wednesday evening. Knowing that nothing short of victory would send them to SCW 2018 in Russia, it was almost too much to take for some of the 80,000 fans in attendance. Australia secures their place in 2018 SWC in Russia. This follows a 3-1 win over Honduras. Cometh the hour cometh the man! In the 54th minute, Captain Mile Jedinak fired in a free kick which took a wicked deflection and buried itself into the bottom corner. An audible sigh of relief could be heard across the stadium. Jedinak followed this up with two spot-kicks completing his hattrick for the evening. I don’t think there would have been too many bets placed pre-game on the captain bagging a hattrick! So, after this evening’s game, Australia become the 31st country out of a total 32 nations to qualify for Russia 2018. This makes it the fourth consecutive time that Australia has qualified for soccer’s main showpiece and their fifth overall. 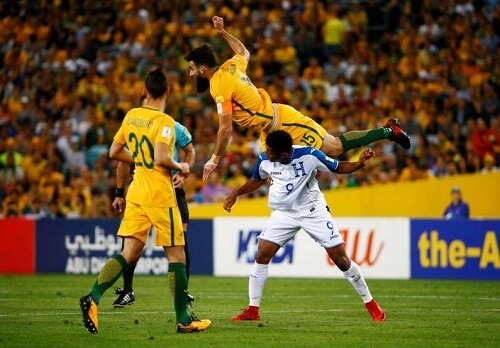 With the likes of Italy not qualifying and the 1st leg between Australia and Honduras ending in a goalless draw there was no certainty that the Socceroos would make it to SWC Russia 2018. With only 211 days remaining till the main event kicks off in June 2018, Australians will be glued to their TVs to watch the live draw taking place on Dec 1, 2017. Once the draw has been completed, fans will be able to buy tickets to their desired matches so they can support Australia live. There have been mixed reports stating that fans with match tickets won’t need visas to enter Russia, however rather play things safe and make sure you have arranged travel visas ahead of time. Take note of the currency exchange and travel with roubles instead of Traveler’s checks as these are often not welcome in Russia. Luckily the SWC is not scheduled during Russia’s famously harsh winters, so there is no need to pack for cold weather. Average temperatures across Russia during June and July are pleasantly in the mid-20s. Australians will need to take a voltage adapter as Russia uses the 220 volt/50hz European standard two-pin plug. With Russia being such a large country, time zones vary depending on where you are. Kaliningrad has GMT+2, Moscow is GMT+3, ST Petersburg is GMT+4, and if you find yourself in Yekaterinburg, it is GMT+5.